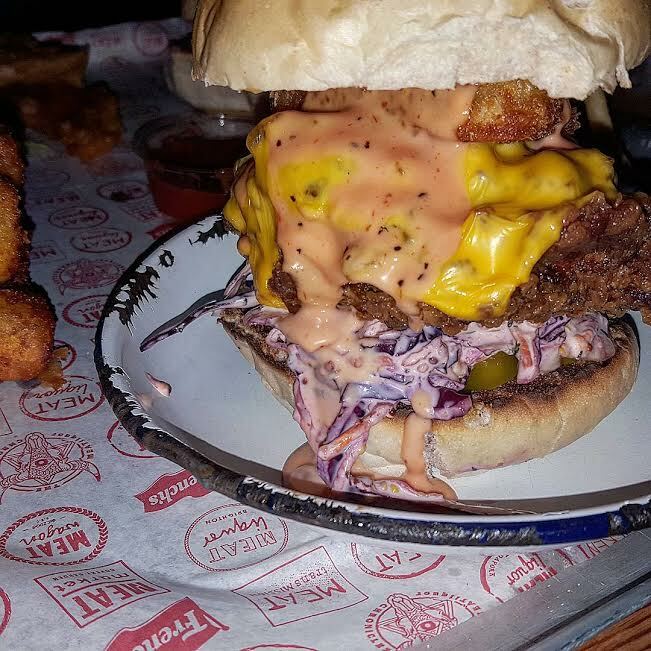 I'm getting hungry just looking at this food, of course today I am going to talk about my experience with MEATliquor in London. I will apologise for the picture quality, but the MEATliquor restaurants are dark as anything so I had to use my flash but I still wanted to share it with your guys anyway! As you know I am back in the UK and loving life, I recently met up with my pal Alisha after she finally came back from her travels around Vietnam and we needed a bloody big catch up so we went to get some food. Alisha is the pal I'm gonna explore different restaurants with around London, we both love different cuisines so she is like the perfect partner. As you can see we kinda went all out in MEATliquor and ordered pretty much everything, but you have to indulge every now and then, obvs! So let's have a chat about the actual food, we both ordered burgers each and I had the Tower Block Burger which was a fired chicken fillet, with cheese, slaw, jalapeños, onions, Russian sauce (no idea what that was, but it was nice) and a hash brown! That's a lot of burger and it was literally built like a tower, I could barely eat it. The chicken was cooked so well and wasn't dry or too crispy. For sides we shared, fried pickles which has THE yummiest Blue Cheese Sauce, fried mac and cheese and some fries. I loved the fried mac and cheese, but i mean, what's not to love? The fried pickles were also bloody nice but they were a little big so when you bit into them the pickle would strip out of the batter so you were kinda left with just the battered shell, but it was still nice. The fries we perfectly thin and crisp and as you can see a bloody massive portion which is perfect for sharing really. We also had cocktails and I tell you what they are delicious, they had kind of unusual flavour combinations but worked so damn well. I had the Bristol Fizz which had vodka, with pear, strawberry and lemon juice with a little bit of fizz o top it up and it went down bloody well. The atmosphere at MEATliquor is like SUPER relaxed, the waiters and waitresses are very chilled and not at all intrusive when taking your order, the decor is very trendy with a kinda Hoxton/Shoreditch kinda vibe. They don't have napkins, they just have paper on a roll, like kitchen roll. You can't book a table for parties smaller than 6 so you just rock up and hope for the best, but as it is so causal I image it's not too hard to get a table. Overall, the food was great, the drinks were great, it was the perfect way to have a relaxed but foodie catch up with a pal. 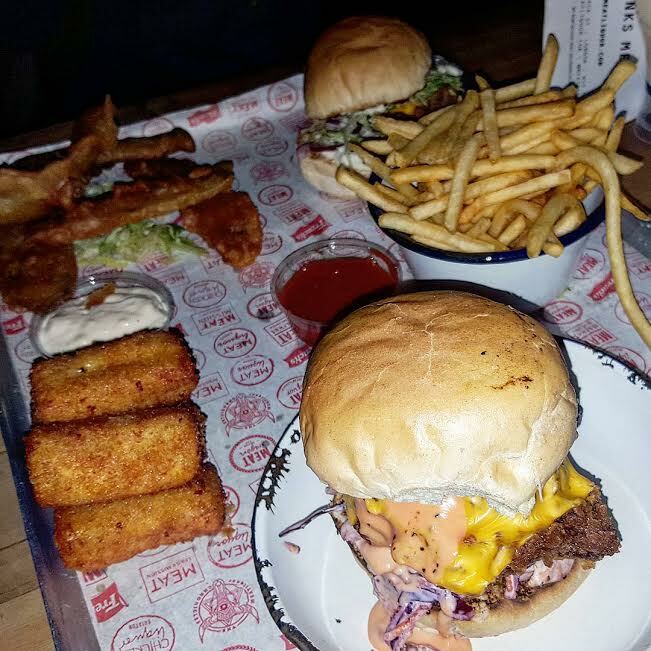 Have you been to MEATliquor? would you like to follow for follow ? Sat here at my desk and omg DROOL. I love a good burger and that looks bloody insane. I really want to visit here! The cocktails sounds super lush too. I need a friend to explore restaurants with!! Ive only been once but this place is super cool !